Enterprise's writers and producers had the unenviable task of creating first contact with the Borg substantially earlier than Captain Picard's crew. The problem with watching Star Trek: Enterprise is the realization of how very much more this prequel could have been and how very many missed opportunities the show racked up during its (aborted) five year mission. Fans expecting rumblings of the Romulan War, early groundwork for the United Federation of Planets and hints at the mysteries that started with the original series way back in 1966 were either about 1,701 different ways of out of luck, or would have to wait for the final season of the show. The second season exacerbated the issues and missed opportunities with a series of standalone, even monster-of-the-week episodes that kept the show decidedly “of the now" with very little eye toward the show's canonical future (and real past). Season Two was also a turning point in many areas. From inception, the creators wanted to separate this prequel from the entirety of the Star Trek mythos by simply calling the show “Enterprise". While initially this felt a lot like the line from 2000's X-Men which eschewed “yellow spandex" in favor of their Matrix-like leather uniforms, the gamble didn't pay off for either series and Season Three of the show changed to the name Star Trek: Enterprise. The second season was also the last to be constrained by the individual-episode mandate that kept the show in the “safe" territory of ending each episode in the exact same spot in continuity that the episode started in. This formula worked well in the late '80s, when individual episodes were the norm (aside from the occasional cliffhanger season finale which demanded a sequel in the next season's premiere), but television had already begun to change from the one-off episode structure into a more serialized and addictive programming style previously reserved for the often reviled “nighttime soaps". Fandom for shows like Twin Peaks, Babylon 5 and Star Trek's own Deep Space Nine have led all the way through to today's more serialized and popular shows of today like Breaking Bad, Mad Men and The Walking Dead. Although the trend was already shifting, Paramount (Star Trek's studio) was slow to catch that long-arc bug. That changed starting with the second season finale “The Expanse" which kicked off the next season-long story arc relating to the seemingly malevolent alien race known as the Xindi. The impact of that third season is another review, another time. 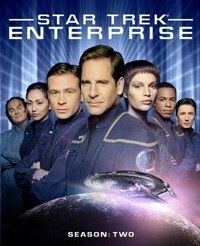 On its way to “The Expanse", Enterprise had its share of rocky episodes that range from the standard Star Trek plots to the contrived to even the humorous. Beginning with “Shockwave Part II" and its continuation of the “Temporal Cold War" subplot that loosely connected parts of the first season, Enterprise soon touched on the Vulcan version of I Love Lucy in “Carbon Creek", detailed an interplanetary incident resulting from Captain Archer's prized Beagle's urinary habits in “A Night in Sickbay", kicks off an accidental first contact because Lieutenant Reed misplaced his communicator in (wait for it) “The Communicator", deals with Vulcan mind melds as an allegory for AIDS infection in “Stigma", Trip finds himself in an unlikely “desert island" romance with a princess in “Preciaous Cargo" and explores the possibilities of a species with three genders in “The Cogenitor". However, Enterprise's second season also had some truly standout events along its 26 episode run. “Minefield" and “Dead Stop" actually do touch upon the impact of the Romulans (albeit carfully so as not to destroy the continuity of the original series' ostensible “first contact" with the Romulan Star Empire), while “Cease Fire" delves deeper into the Andorian race. Similarly, “Marauders", “Judgement" and “Bounty" form a loose trilogy dealing with Star Trek's old standby villain, the Klingons, and their new-found vendetta against Captain Archer. “Judgement" itself serves as a something of a prequel and companion piece to Star Trek VI: The Undiscovered Country with its Klingon justice system and the frozen gulag Rura Penthe. Probably the best and most risky episode of the season is “Regeneration", which serves as both a prequel to The Next Generation's Borg episodes (starting with “Q Who") and a sequel to The Next Generation's first solo theatrical film Star Trek: First Contact. What starts as an homage to The Thing (1982) the frozen (and unlikely) survivors of the destroyed Borg sphere from First Contact reawaken in a Starfleet research station in the Arctic Circle and begin to assimilate the researchers and every spacefaring group they come across. Enterprise's writers and producers had the unenviable task of creating first contact with the Borg substantially earlier than Captain Picard's crew -- they had to do it without ruining the suspenseful unpreparedness the latter crew experienced. “Regeneration" is mostly successful in these areas, however the Thing-homage is brief enough to be barely recognizable and Starfleet's memory-loss about the Borg is somewhat contrived. Still, even with these missed opportunities, “Regeneration" is a very fine Star Trek episode. The victorious taker of the King Cake of missed opportunities is found in the LeVar Burton directed, Keith Carradine starring “First Flight" which is the closest to Enterprise's original Right Stuff in the future pitch. Told in flashback, “First Flight" shows Archer's time as a test pilot with the Vulcans working to slow Starfleet's progress while reckless fellow pilot Robinson (Carradine) gives Earth every reason to press on and Vulcan every reason to continue to squeeze the brakes. The problem with this episode is not inherent to its content, but the surrounding saga itself. As the bonus features detail for us, especially on the final discs three-part documentary, “First Flight" is a microcosm of Enterprise's original intent. This covers an Earthbound reach for the stars that could have (and perhaps should have) realistically filled up the entire first season, rather than the actual series' studio-insisted adherence to largely established Trek themes, including the necessity of starting the show with a fully prepared ship and crew. In said documentary, “Uncharted Territory", writers such as Rick Berman, Chris Black and a uniquely angry and profane Brannon Braga detail their clashes with the new studio heads and the limitations put on the show. While this doesn't make the show innately better, it does stand to engender sympathy in even the most “hating" of Star Trek: Enterprise fans and detractors. Additional bonus features include detailed episode commentaries (some left over from the previous DVD release, some brand new), cast interviews, promotional materials and mini documentaries. Detractors are sure to find something to improve the show and fans will find a lot to enhance the show they already love. Enterprise may not be the very best of Star Trek especially in its second season, but the valleys here are often overshadowed by some very impressive peaks along the way. Do these improve the show significantly? Or do they just make us wish for what the promising show could have become?